Spritz flower cookies are easy to make yet not your ordinary, everyday cookie; you can make many shapes or change the colors with little effort; and, most of all, this post is a reminder not to let dust gather on your cookie press for eleven months of the year, only reaching into the back of your cabinet to find it in December. Spritz cookies are far more than Christmas cookies! Spritz flower cookies are perfect for a baby shower so I added a dot of pink icing on some flowers for the occasion. Others I left plain and this is a cookie recipe that is pretty even perfectly unadorned. 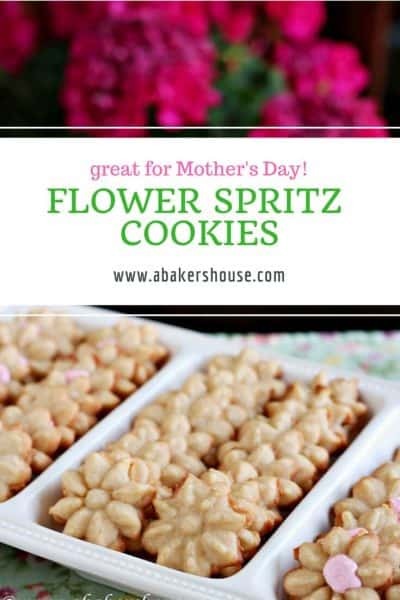 Get your kids involved and add icing and sprinkles and all sorts of decoration, but in its most simple and basic form these flower Spritz cookies are a delightful treat. They are also an excellent cookie to make and package to be sent in the mail. They don’t break easily and they stay fresh longer than you’d expect. Spritz cookies are made with a cookie press. Often cookie presses come with a variety of shapes but are most popular around the holidays. These easy cookies are a reason to dust off your cookie press and bake Spritz cookies any time of the year! Cardamom is the spice that makes Spritz flower cookies stand out from your standard butter cookie. If you don’t have cardamom at home, feel free to omit it. The pure vanilla extract makes a big impact on these simple cookies as well. Here’s the recipe that came with my cookie press. I used it for Christmas cookies as well here. 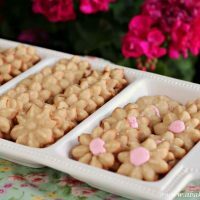 Use your cookie press all year long by making these flowery cookies-- welcome spring! Combine butter and sugar in a large bowl. Beat with an electric mixer until light and fluffy. Add the egg, vanilla extract, cardamom and salt with the electric mixer. Now with a spoon stir in the flour until well mixed. Roll the dough into a log-like shape so that it will fit into the cookie press. Pack it in the tube tightly. Choose your design and begin pressing the dough out by clicking just once on the cookie press. Fit about 12 cookies to a baking sheet. I used parchment, though the instructions state that an ungreased baking sheet is best and that no parchment is necessary. Do not refrigerate the cookie dough before using the cookie press. The dough won't release as easily if it is cold. 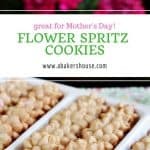 Pin these lovely Spritz flower cookies recipe for later! These are so pretty Holly. I like a cookie that is not too sweet and preferably bite size. Looks like these tick both the boxes. Thanks, Karen, yes these fit that description. Unfortunately for me, bite-sized means that I eat half a dozen without blinking an eye…I really like these!! Funny Holly – I saw your post title and photo and thought, gee, why don’t I use my cookie press and make spritz for more than just Christmas…and then read your post! What a great idea; these would be the perfect cookie for a baby shower or other summer event. So pretty! I agree, Barb, these are so easy to make and shouldn’t be left for December only. There is a butterfly design I’d like to try as well as a few other flowers too. My set has a pumpkin too so I guess I’ll use the cookie press again in October if not before! These are really pretty cookies Holly, the addition of cardamom sounds yummy. 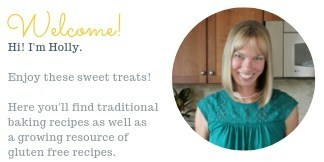 Thanks, Laura, cardamom is a relatively new spice in my kitchen and I hope to find other recipes that use its distinct flavor. Do you bake with it often? Oh Holly….these are so pretty! I love the pink dots in the centers…it truly turns what everyone thinks of as a Christmas cookie into something perfect for a spring day! Just lovely! Thanks, Anne, yes the pink brightens these up a bit. I guess I could have colored the dough as an alternative. I saw some photos online recently of flower cookies with all sorts of colors- looked really festive.